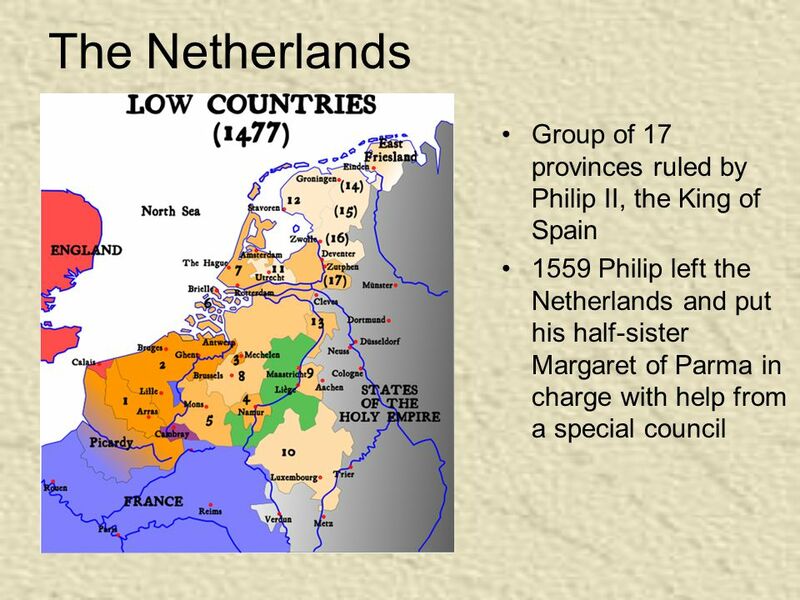 The Netherlands Group of 17 provinces ruled by Philip II, the King of Spain 1559 Philip left the Netherlands and put his half-sister Margaret of Parma. 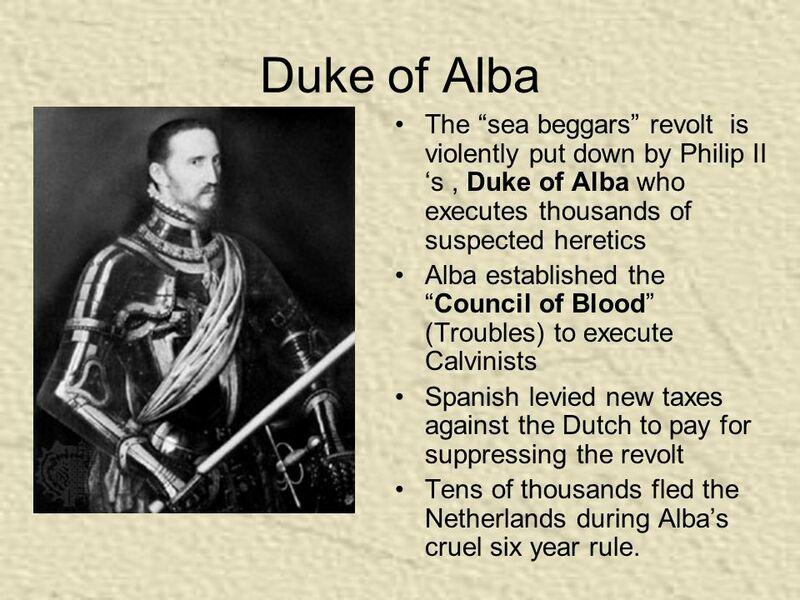 6 Duke of Alba The “sea beggars” revolt is violently put down by Philip II ‘s, Duke of Alba who executes thousands of suspected heretics Alba established the “Council of Blood” (Troubles) to execute Calvinists Spanish levied new taxes against the Dutch to pay for suppressing the revolt Tens of thousands fled the Netherlands during Alba’s cruel six year rule. 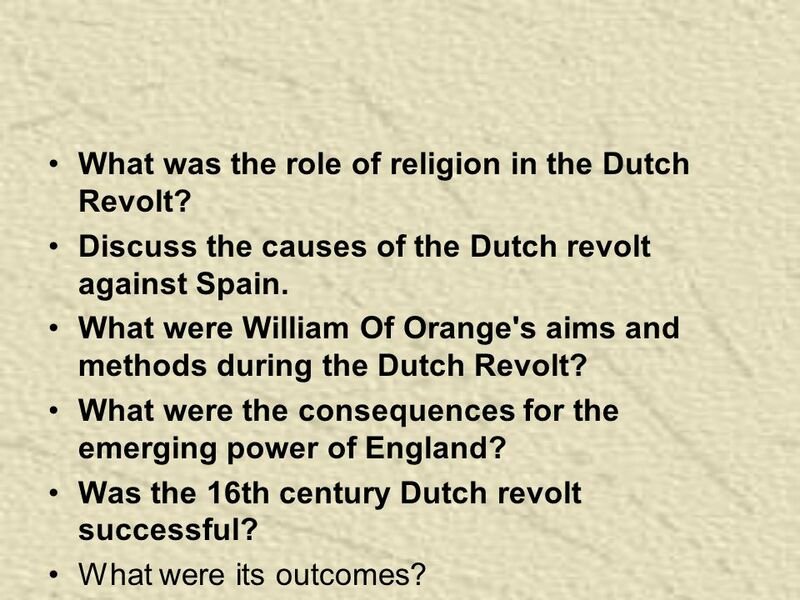 12 What was the role of religion in the Dutch Revolt? 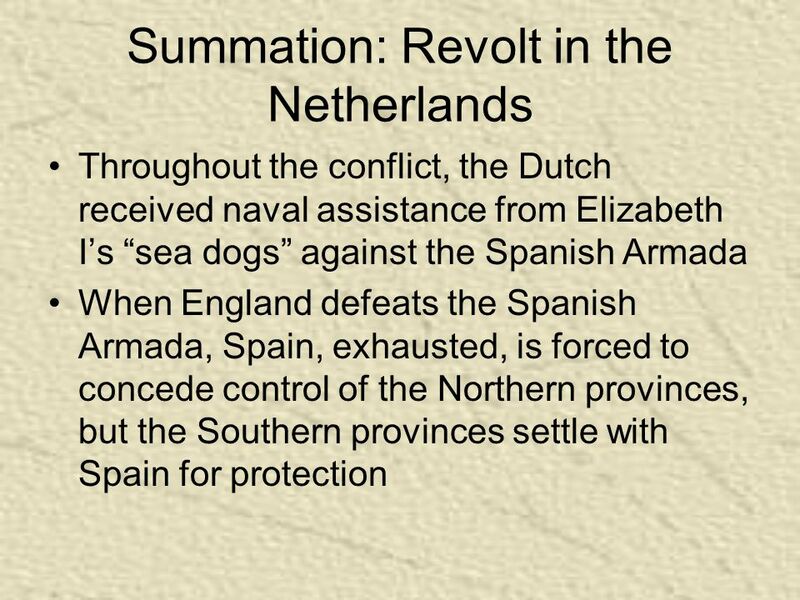 Discuss the causes of the Dutch revolt against Spain. 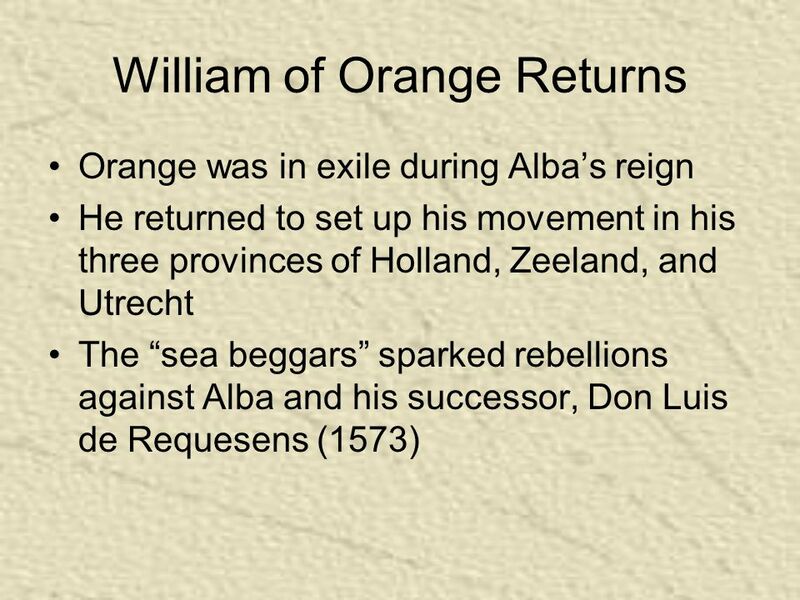 What were William Of Orange's aims and methods during the Dutch Revolt? What were the consequences for the emerging power of England? 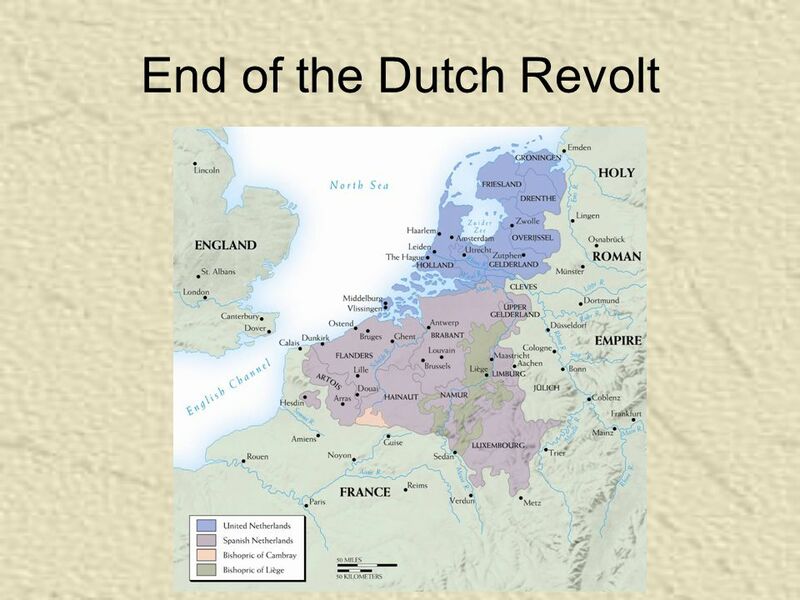 Was the 16th century Dutch revolt successful? What were its outcomes? 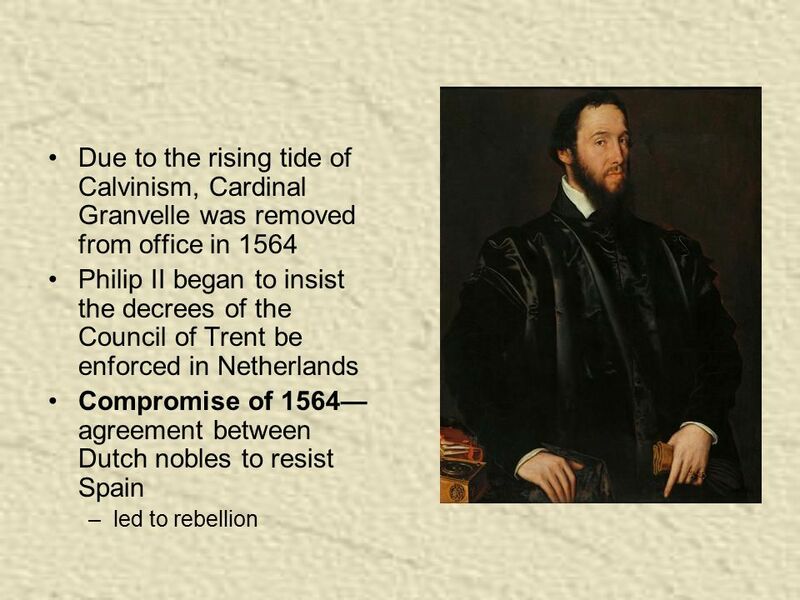 Download ppt "The Netherlands Group of 17 provinces ruled by Philip II, the King of Spain 1559 Philip left the Netherlands and put his half-sister Margaret of Parma." Religion Politics and War 16 th & 17 th centuries. The Holy Roman Empire (know the Location) NOT Holy, NOT ROMAN, and NOT an Empire. A loose collection of GERMAN Kingdoms, principalities, & church holdings. 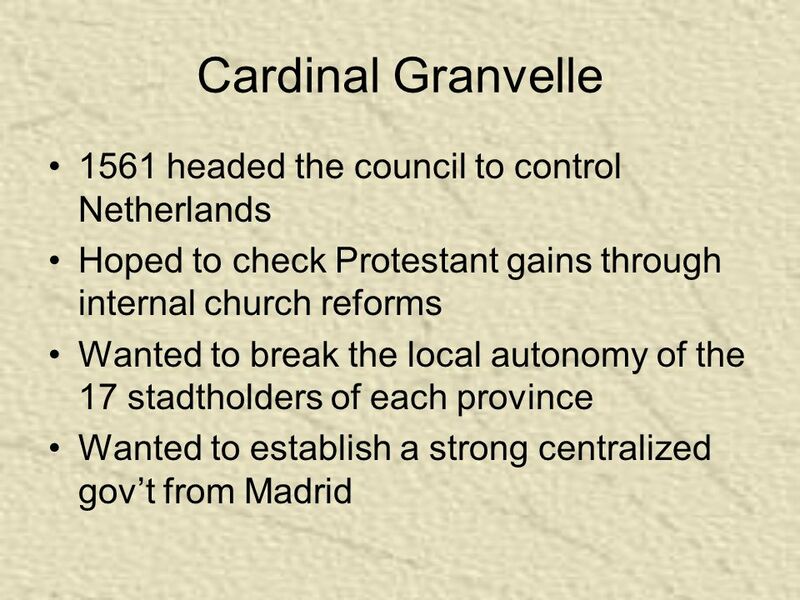 16 th Century religious reform movement Led to new Christian sects not answerable to the Pope Also known as the PROTESTANT REFORMATION. Albrecht Dürer, “The Martyrdom of the Ten Thousand” (on Mount Ararat, by the Persian King Saporat, at the order of Emperor Hadrian), painted in 1508. Religious Wars. 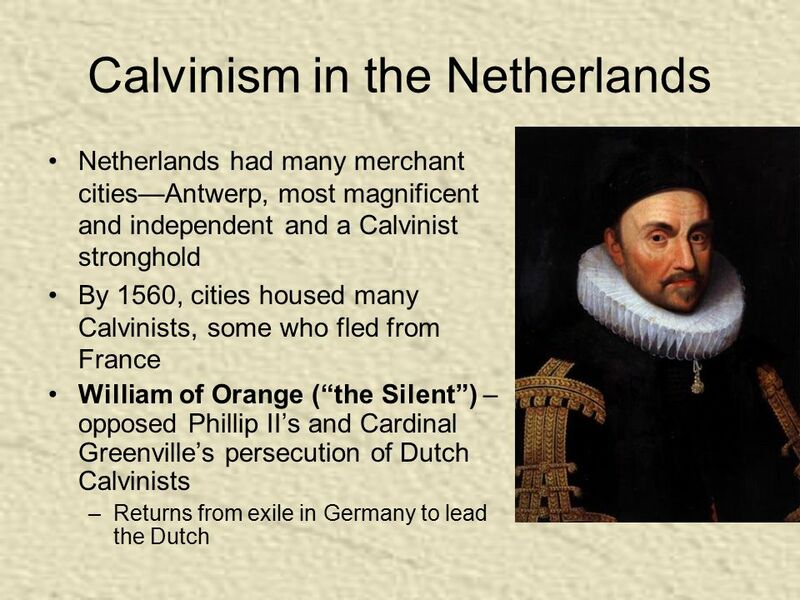 The French Wars of Religion ( )  French concerned with the spread of Calvinism  Calvinists (called Huguenots)  Come from all. Phases of the Thirty Years’ War. Bohemian Period of the Thirty Years’ War Catholics name Ferdinand II as Holy Roman Emperor, who immediately revokes religious. Philip II Cardinal Grenvelle Duke of Alba Don John Francis,Duke of Alencon. 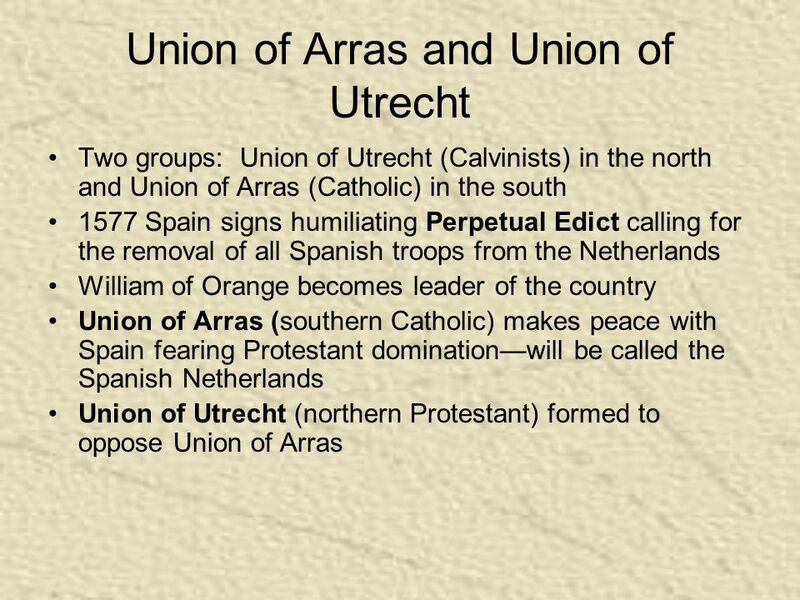 Netherlands Revolt Mid-sixteenth century Netherlands was very different from either France or Spain – 17 autonomous provinces, the most important. 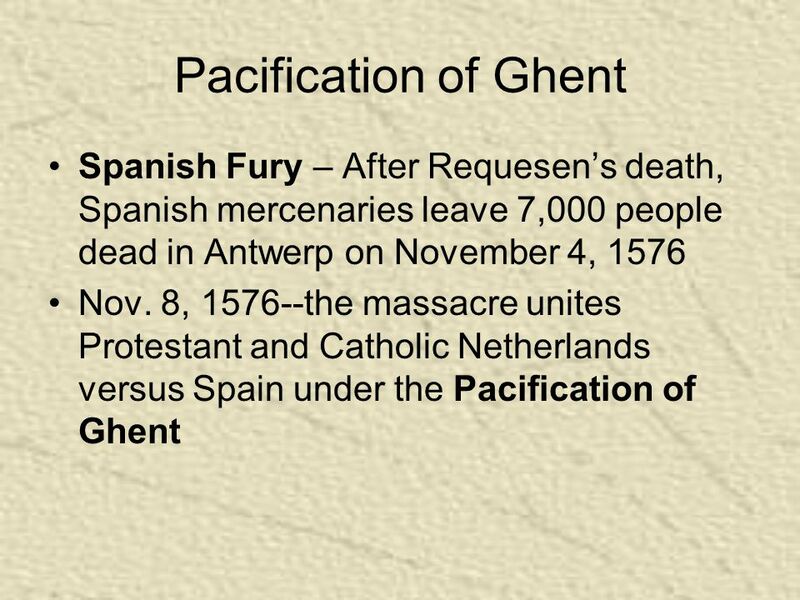  Huguenots- (French Protestants)- watched by French monarchs as early as 1520 when protestant ideas arrived in France  Huguenot persecution became policy. William III of Orange (r. England ) 1516 Charles of Habsburg becomes King of Spain and Netherlands Reign of Charles as Holy Roman Emperor. The English Revolution. Religious Tensions Left Over From the Reformation - France 30 years of fighting breaks out in France and ends in 1589 Henry IV. Wars of Religion Libertyville HS. 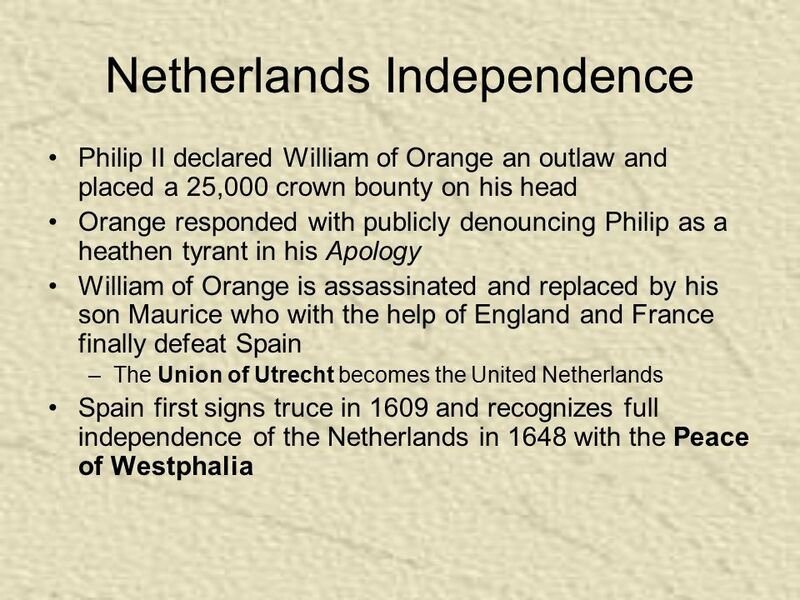 Huguenots Saint Bartholomews Day Massacre Edict of Nantes, 1598 “The Most Catholic King” – Philip II William of Orange Queen Elizabeth I Act of Uniformity. D UTCH W AR OF I NDEPENDENCE Presented by: Christina Perricone, Betsy Lucas, LiAnn Linck, Chris Immen, Nick Gioia, Ricky Manz, and John Raneri.